I always try to have some insight and share stories to help you in your BNI and professional world. This month’s blog is a little different. This time I have a request for you of support, and I have included the steps on how you can do this. 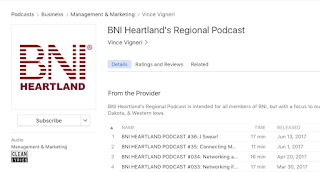 We have a Podcast for the BNI Heartland region. If you are a regular listener, thank you. Please keep reading this blog so you can increase your support and enjoyment of these podcasts. If you don’t listen to the podcast, please try out a few episodes. I really enjoy making them and we have members from all over the region who have shared experiences and ideas, plus you get a CEU for listening to them! This is a super easy way to download and listen to all the episodes of the podcast on your phone whether you are in the car, at your office, or traveling on an airplane. Make sure you become a follower of the podcast once you find it in the app and share it on your social media. Also, make sure to select the Heart icon for the ones you really like! The Podomatic website is easy to use and very well put together. You can make a sign in or use your Facebook account to have an account online. Once again, when you get signed in, please follow the BNI Heartland podcast and share it on your social media. That’s right - we are on iTunes!! 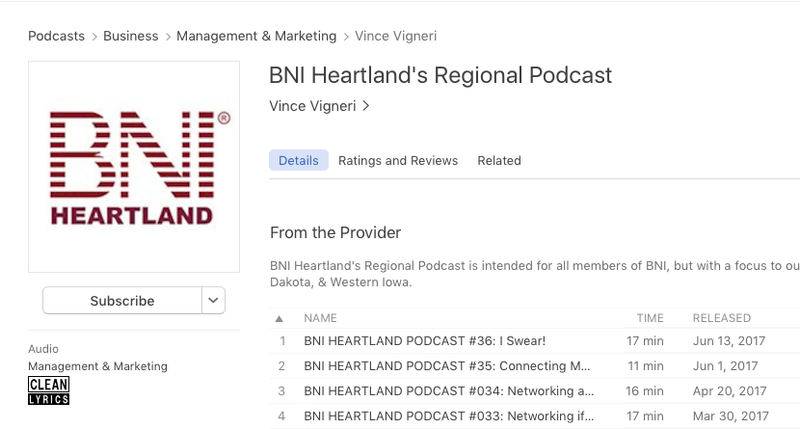 You can go in to the app on your phone for podcast and search for BNI Heartland and it will show up. Please follow the podcast so you get updates of new episodes being published. But, in order to help us make more traction, please follow these steps so we can get some reviews and ratings. I would be shocked to see our podcast in the top 100 but with your help we can be one step closer. Hopefully that gives you a little homework that will make a BIG impact on the BNI Heartland Podcast. We all believe in Givers Gain so please share this education with others you know. It may even spark them to check out BNI if they have not! NOW, how do YOU become a STAR??! If you have a story or an idea that would make a great podcast please reach out to me, Brandon@bniheartland.com and we can talk about getting you and your business on the podcast to share with all of our subscribers. Once again, please promote and support BNI Heartland as much as you can. It always amazes me how much pride I see in our members and in this day of social media this is a huge part of showing our network that pride. I can’t wait to see our activity take off with your support and I promise you we have some amazing content being published. You won’t want to miss it! What are you waiting for? GO GET PODCASTING!!!! In BNI worldwide there are over 8,000 chapters, all with a different culture, but yet the same structure. Dr. Ivan Misner says “Culture eats strategy for breakfast” and that could not be truer in the BNI world, but one culture killer is when the members focus on task vs. purpose. All the task members do in BNI are to help grow your business, when task are done with purpose they create results. Vince and Brandon have created a series of 5 podcast to really show the purpose of the slips. Not how to fill them out, but why we have them and the culture on which they are built on, keeping our core values top of mind in all 5 podcast. In this episode, and the next 4, Brandon and Vince will be going over entering slips, electronically!